New feature to allocate product for your customer without shipping until all products are ready to be shipped together. For those customers subscribing to the Stitchex Enterprise Plan, a new feature is available under Sales Orders. Previously, once a sales order was ready to ship, you would create a pick ticket, select the items that were ready to be shipped and they would be shipped regardless if the other items were ready. This method meant your customers could receive multiple boxes before completing their orders. 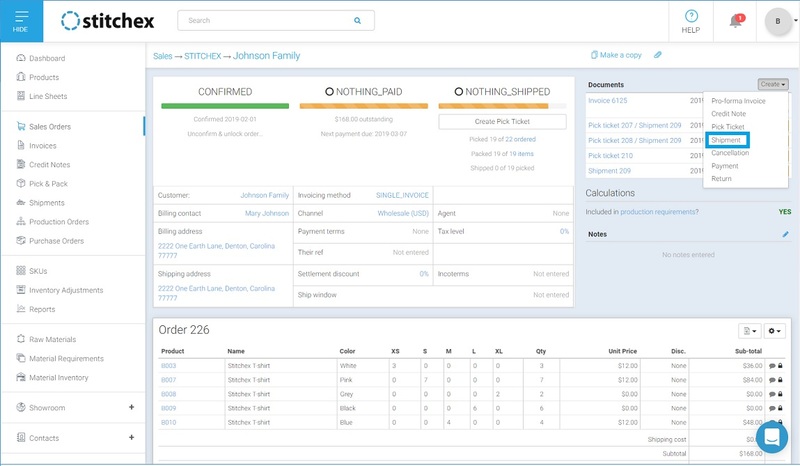 Now, with this new feature in the Enterprise Plan, you can allocate products to your customers and ship all products together when the full order is ready to be shipped. In addition, you can control which items you want included in each box when you are ready to pack and ship. Once the items are shipped, then, they are removed from inventory/stock. To find out if you are in the Enterprise Plan, check your subscriptions. If you see "Enterprise" next to "Your current plan", this new feature is available to you. 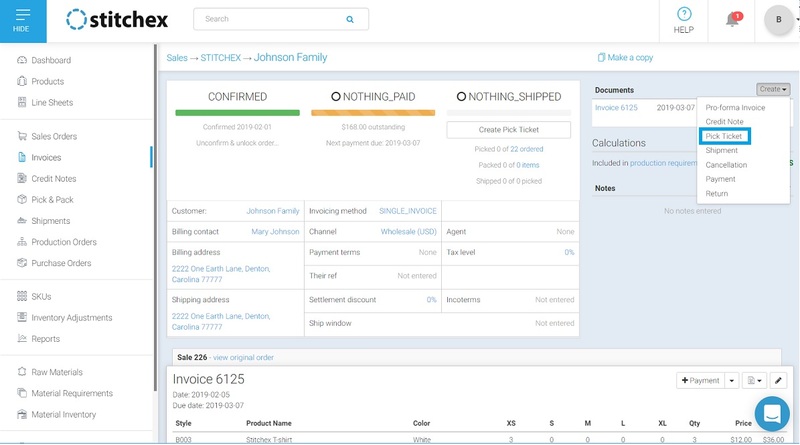 See Creating a Sale, Confirming a Sale and Invoicing. Once these prerequisites have been completed and your merchandise has been received, you are ready to create Pick Tickets, Pack Boxes and Shipments. From the Create a Pick Ticket screen, select the products you want to include in your Pick Ticket. If you only select some of the products, these items will be "allocated" meaning no one else can use that item to fill another customer order. This does not remove the quantity from your inventory count. And, you may keep it allocated until you are ready to "Pack" and "Ship" with other items as they become available. Once you select the item, it will display in your documents section as a "Pick Ticket" with a status of "Unshipped" as shown below indicating it is allocated. When you are ready to ship some or all of your order, select Create>Shipment from the drop down menu on the top right of your screen as illustrated below. Once you are ready to ship, you will want to Pack your boxes. Scroll down to the Pick Ticket at the bottom of the and select the "Pack" button on the top right corner of the screen. After Packing, you will return to the screen where you started your packing. Click on the Ship button at the top right as illustrated below. At this point, these quantities will be removed from inventory and your product will ship. For additional details on Exporting a Bergen Logistics CSV File, Editing Pick Tickets, see also Pick & Pack. For additional information on undoing shipments, reverting a shipment back to a pick ticket Pick Ticket and managing stock availability, see also Shipping.